PHB Ethical Beauty has been on my shopping list for a while. I am sure other bloggers have mentioned this brand but I know them via the Free From Skincare Awards. The range of products they offer is slightly overwhelming, it's huge and covers top to toe skincare and makeup. Products are free from alcohol, animal ingredients and testing (Vegan trademark & BUAV leaping bunny), parabens, SLS, synthetic fragrances, synthetic dyes, phthalates, petrochemicals and Methylisothiazolinone. All of this is very impressive to me but I really like that they have an unscented product range. 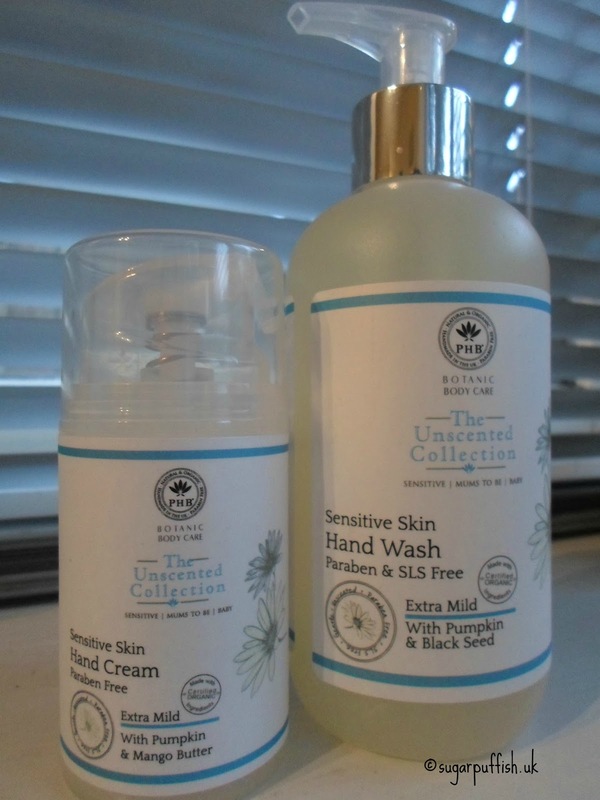 I decided to buy the Extra Mild Hand Care Duo (unscented Hand wash & hand cream). Unscented skincare is perfect for me as it saves me the hassle of dealing with unpredictable skin when I use essential oils. The hand wash does the job, I have no complaints but it is the hand cream that has impressed me. Up until this purchase I had either used Dr Organic Manuka or Pai hand creams, both products are great and work well for my dry skin but I have totally fallen for the PHB cream. I need super hydrating products in the winter but like most people I want to be able to go about my days work. I will not deny it is nice to pamper your hands in rich oils overnight but I need to apply cream every time I wash my hands so my products need to work quickly and give instant results. The PHB hand cream is a perfect combination of rich ingredients (shea butter, apricot, pumpkin seed, mango butter) but it does not feel heavy and sinks into my skin quickly. PHB Extra Mild hand cream has won me over and I can see myself buying this again. I paid £18.50 for a hand soap and hand cream gift set (individually £9.95 & £10.95). There are often special offers on PHB's website so worth keeping an eye out for discounts. I haven't heard of this brand, but it sounds great. I have such sensitive skin when using commercial brands. They become so dry and itchy so this sounds perfect. I find its hard to find a hand cream that works quick and doesn't leave an oily residue. I experience the same problems as you so I think you would probably like this one, worth a try may be?